I stare incredulously at my six-year-old. 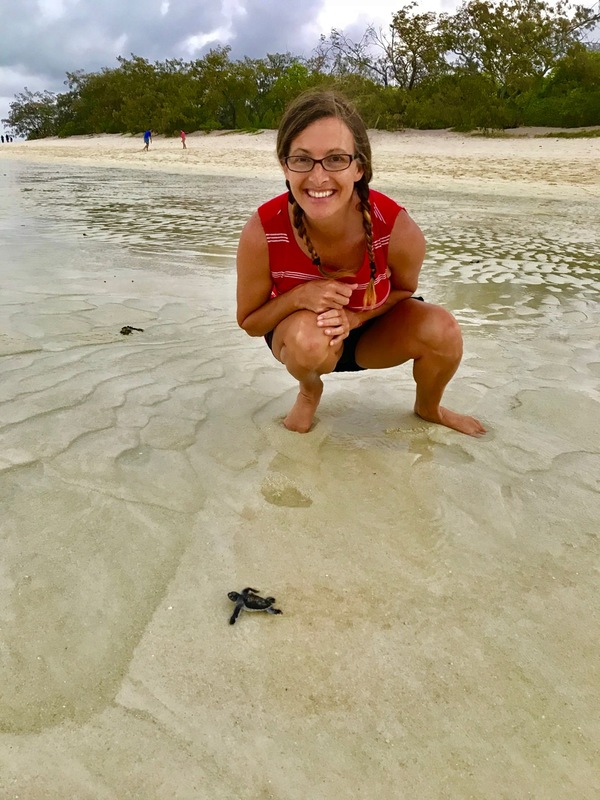 After telling her for the tenth time that no, no she canNOT pick up the itty bitty baby turtles scampering all around us, I turn around and there she stands, a turtle in each hand, their flippers flapping in the air. It is low tide here on the Great Barrier Reef's Heron Island, and the once-submerged stony shoreline rises several feet above the water now. Jagged rocks tower like mountains over the newly hatched green turtles, and at least a hundred of them stumble helplessly in and out of spiky crevices trying frantically to make their way to the ocean. Turtles struggle over the rocky shoreline to make it to the ocean on the other side. Others scramble to the turtles’ aid, both adults and children, so I relent. Together, Eden and I join the small group spontaneously assembled, and we assist the turtle hatchlings over the slippery rocks, delivering them gently into the shoreline shallows beyond. As we work, dusk turns to night and the beach glows bright beneath the moon. Eden beams, and although I wonder whether stepping in to help is the right thing to do for the turtles, I have to admit it sure felt like the right thing to do with my girl. It turns out that I didn’t have to worry about giving the turtles a hand. As our time on Heron Island continues, we hear many similar assistance stories from both naturalists and guests alike. 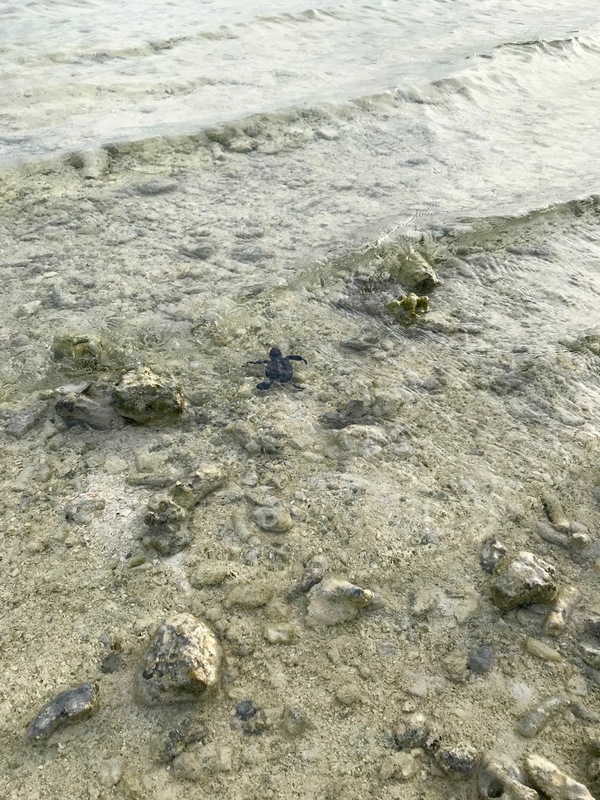 For example, one morning, guests removed and relocated to the ocean several hatchlings found swimming aimlessly in the pool. On another morning, a naturalist rescued an entire nest of newly hatched turtles wandering about inside an electric pump house. (It’s anyone’s guess as to how they got there!) A man speaks of how several people worked together to lift a huge mother turtle over shoreline rocks on which she had gotten herself stranded. In fact, as our week progresses, we witness several nest “eruptions” during the day, and inevitably, people of all ages gather to walk alongside new hatchlings, protectively ensuring they’ll make it to the water without crab or sea gull or rocky shoreline interference. Naturalists tell us that as long as the hatchlings have ample time to use their muscles from nest to shore, a little help from people here and there won’t hurt them. Mitchell & Eden capture on video a turtle eruption. Notice all of the turtles in the foreground! If there was anything more inspiring than watching the turtles persevering and conquering each challenge that came their way, it was watching ordinary people of all sorts of nationalities, races, ages, and status drop everything to protect a three-inch animal from seagulls, knowing it could be snapped up by a shark the minute it slipped into the water. Autumn is right. While the getting-snapped-up-by-a-shark part is less-than-stellar (after all, estimates suggest that only 1 in 1,000 hatchlings make it to adulthood), seeing people rally around these statistical underdogs does awaken a little faith in humanity. Mitch & Eden, among others, stand guard over hatchings swimming in the shallows. People not only mobilize to make safe turtle passageways to the ocean, but many also squeeze around areas where nests are about to erupt. One couple huddled up under some beach brush points out tiny turtle heads peeping just out of the sand’s surface. Keeping vigil for over two hours, this couple sits patiently, ensuring predators stay away from the vulnerable babies. Apparently, hatchlings break free from their eggs, rise slowly to the top layer of the sand over their nests, and wait instinctively for cooler temperatures before climbing out to freedom. Eden & Autumn point out a turtle nest. It will be several hours before this one erupts! Those babies on top risk getting picked off by hungry seagulls. Also, it's hard to believe, but there are probably 100+ turtles buried underneath these few at the top. Autumn & Mitchell vlog about this turtle nest around which we stand vigil. Problems arise for the (unlucky?) strong turtles whose heads protrude first out of the sand. Sea gulls swoop down and pluck these pioneers from their haven. So, to find a turtle nest, we look to the skies for any gull holding a squirmy hatchling in its beak; usually, in the vicinity below, we discover a cluster of sleepy baby turtles, not quite ready to make their way into the scary wonderful world. Together, we, too, huddle around a nest, hoping to be there when it erupts, longing to help every last baby make it to the water. Sleepy baby turtles not quite ready to leave the nest. They blink lazily at us when we peer down at them for a closer look. 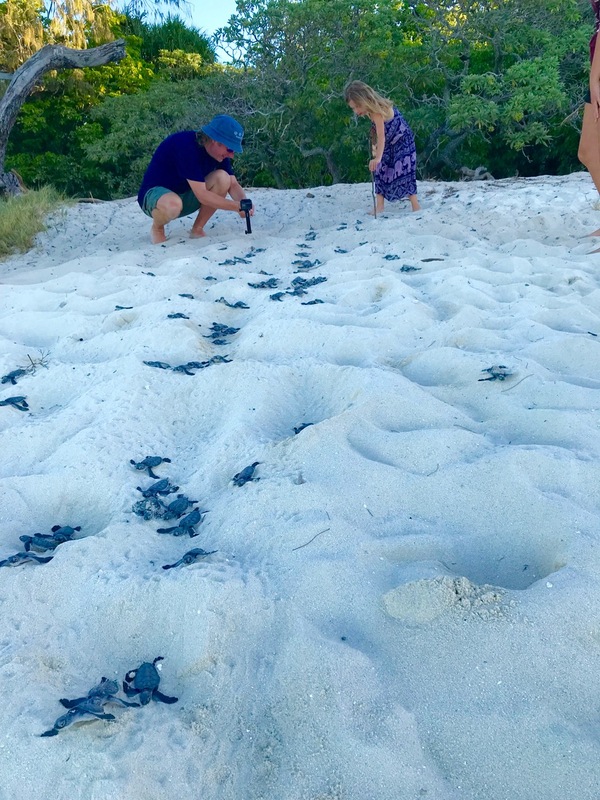 Our time on Heron Island speeds along, and the privilege of witnessing turtle hatchlings pilgrimage their way to the ocean presents itself nearly every single day—sometimes several times a day. It’s a shared adventure forever woven into the fabric of our family, and one for which I’ll be forever grateful. Autumn cheering along a turtle hatchling. Rhonda ensuring a turtle baby makes it to the water.